Our cabin is not ready to sleep in yet, so last weekend we stayed at a vacation rental about a mile from our cabin. 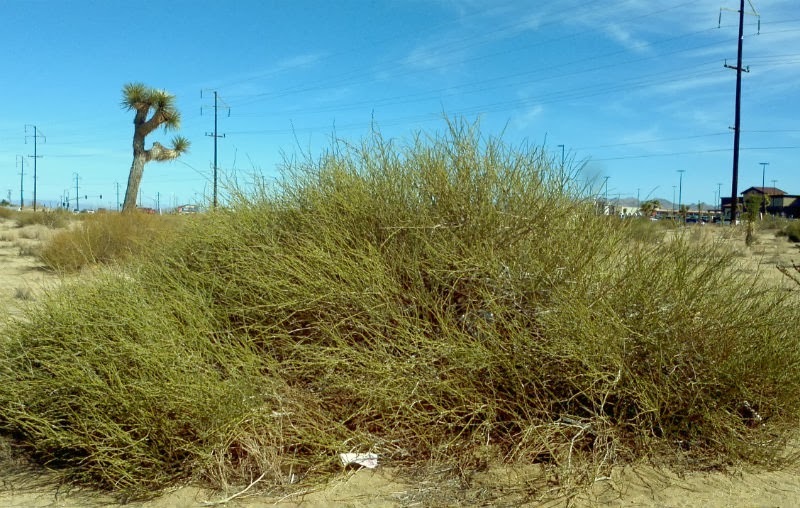 I'd been looking for ephedra, which I was told grew everywhere in Joshua Tree. I'd never seen it except in photographs and I'd not seen anything that looked like it on our property. When I stepped out of the car at the vacation property, however, I stumbled straight into a tangled bush that looked to me how I'd heard ephedra described, but not what I'd expected. I found the same plants in the wash, only bigger and more developed, one with a tiny cone on it. Ken pointed out that one of the plants was growing in a circle and I remembered that I'd read ephedra grows in clonal rings, like creosote. You can see the ring here, but you can also see it in the photo below. 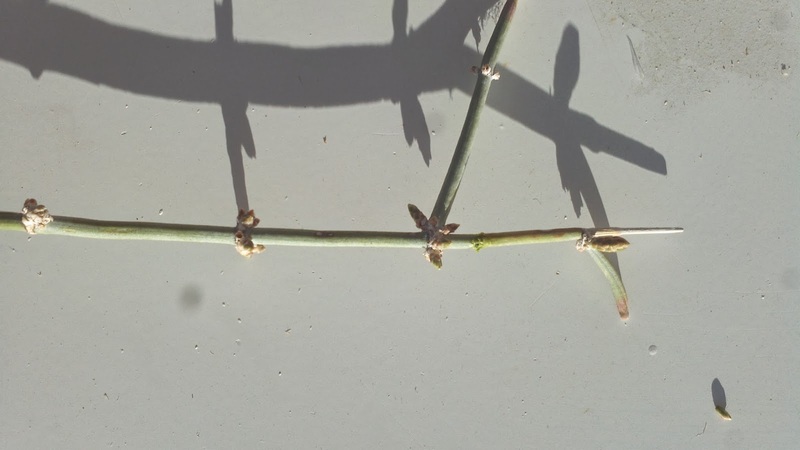 It's a brilliant reproductive strategy for plants growing in such a harsh environment. I took a picture and sent it to my friend Nance Klehm, an extraordinary herbalist and wildcrafter. She confirmed that it was ephedra. I knew, though, that there must be another kind that was more familiar to everyone and as we drove out of town I saw what I suspected was a different kind of ephedra in a vacant lot. Ken stopped. I jumped out, took a picture and a cutting and jumped back into the car. 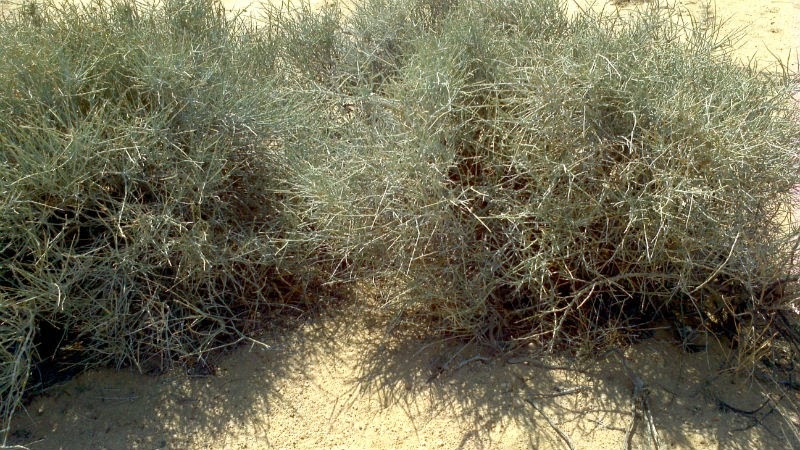 Nance later confirmed that both plants were ephedra. 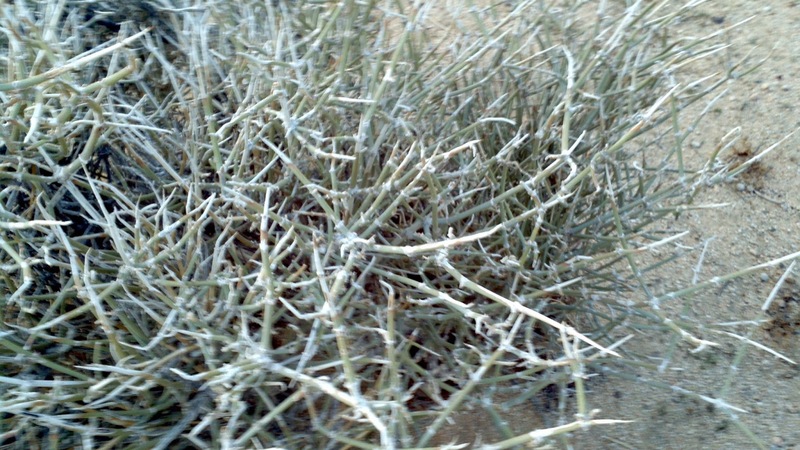 The first ephedra I'd seen, the tangled desert bush, is Ephedra torreyana. It's February right now and the plant hasn't greened or flowered yet. It appears mostly white, or bluish-grey, segmented, kind of like horsetail, but with "cones" growing at the nodules. It's more closely related to pines, junipers, and spruces, and according to Cynthia Anderson it does grow in clonal rings. I can't wait to see how it develops over the coming weeks and what it looks like when it blooms. The second kind I found was bright green, Ephedra viridis. Both kinds do indeed grow in many places in the Morongo Valley, just not on our property. When we returned to our cabin I felt a little disheartened by the lack of biological diversity. We have mostly creosote and white bursage, a few beavertails, pencil and teddy bear chollas, and another plant I haven't identified yet. BUT, we also have desert lupines and apricot mallow which I have not seen on other properties so my hope is that in time we'll be able to diversify the flora and fauna. I do have to say I'm coming to love the creosote bush. It grows in two aspects on our property. The first is tall, upright, sparse and lacy. The second is denser, shorter, practically horizontal. The two grow next to each other. They are so different I wasn't sure it was the same plant. Shrubs with shallower stem angles take on a more hemispherical shape as opposed to an inverted cone shape. Shrub canopy architecture also affects soil characteristics creating "islands of fertility." 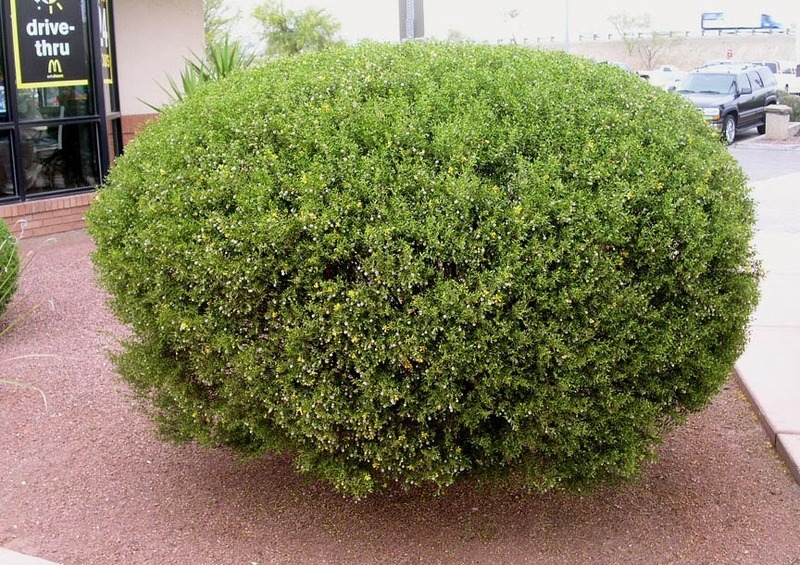 Shrubs with hemispherical shapes collect much more litter underneath, hence soil nitrogen is greater under hemispherical shrubs than under inverted cone shaped shrubs (Whitford 2002). So it seems it's one plant. Our neighbor hates them and startled me when he talked of pulling them out. They are "old growth" desert, just as the redwoods are "old growth" forest. I found a creosote ring on our property about 20 feet across. It could be hundreds, if not thousands, of years old. There's a clonal ring not far from Joshua tree, King Clone, that's 45 feet across and judged to be more than 11,000 years old - perhaps the oldest plant on earth. I think one way to garner appreciation for the plant is to change its common name. I prefer "gobernadora," Spanish for governess, or nurse plant, and hediondilla, which rolls off the tongue a little easier though the meaning is "little stinker." What Do We Really Need?